After almost three full weeks of exploring Tokyo and getting used to the feel of city life, many of us were excited to experience a change of pace and set out for our week-long experience of Western Japan. We left Sakura Hotel on Monday morning by shinkansen (the famous Japanese bullet train) to Kyoto, the ancient city which was the nation’s capital from its establishment during the Heian Period in 794 until the end of the Tokugawa Shogunate in 1869. After a brief mishap with our departure – which more-or-less involved an epic, movie-esque sprint through Tokyo Station to catch the train before it pulled away from 13 of us, and the heart-breaking separation from Chad and Sheng, who were forced to catch the next train a full thirty minutes later – we arrived safely and met up with our wonderful tour guide, Masako. 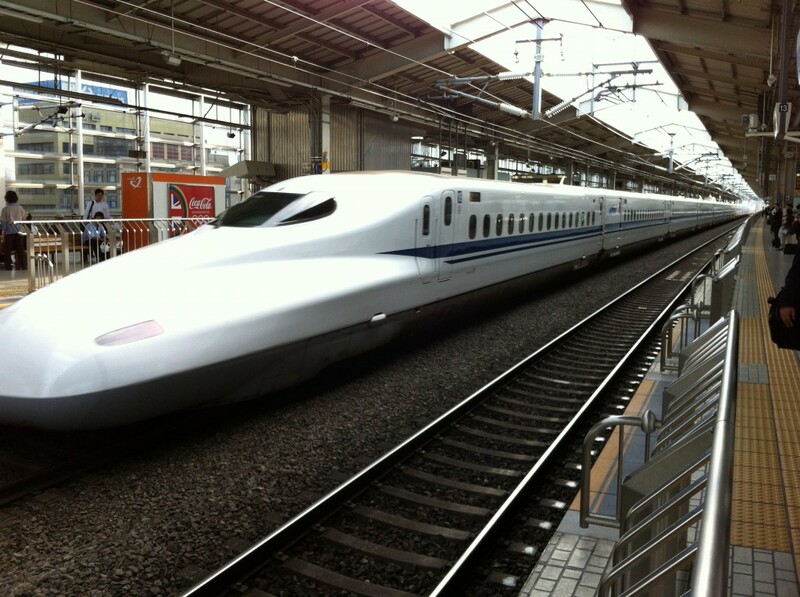 The front of the extremely aerodynamic shinkansen, which we used to travel to and from Kyoto! 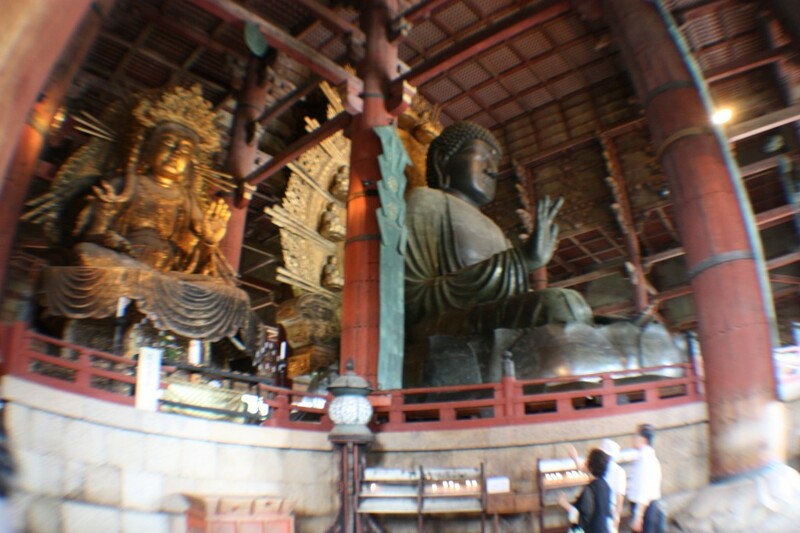 Two Buddhas housed within the giant Daibutsuden, the largest wooden structure in the world. The sacred mood of the temple was accentuated by the hundreds of deer that were wandering freely around the premises, which were so tame that we could actually reach out and touch them. 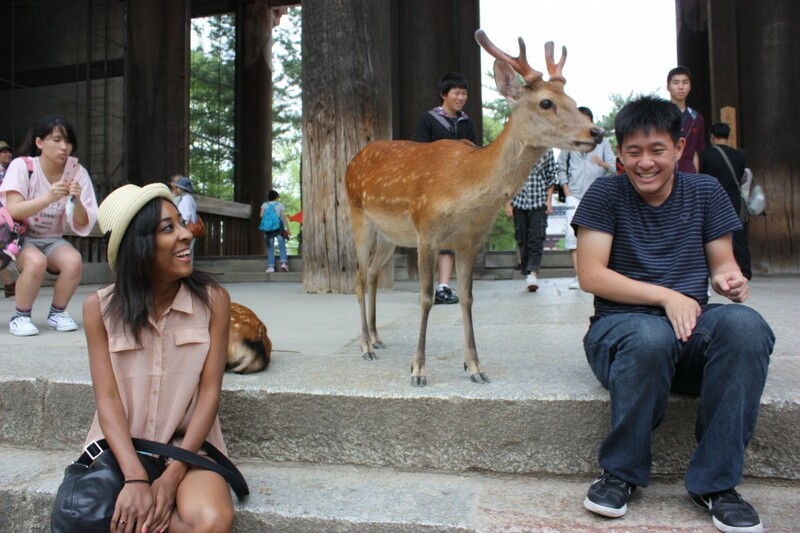 According to the Shinto religion, deer are divine messengers of the gods and guardians of the temple. According to us and the other tourists visiting Todai-ji, they are also adorable. Ki Bum — the Deer Whisperer! Next we visited Kasuga Grand Shrine, a Shinto shrine owned by the Fujiwara family and a designated historical site of Nara. 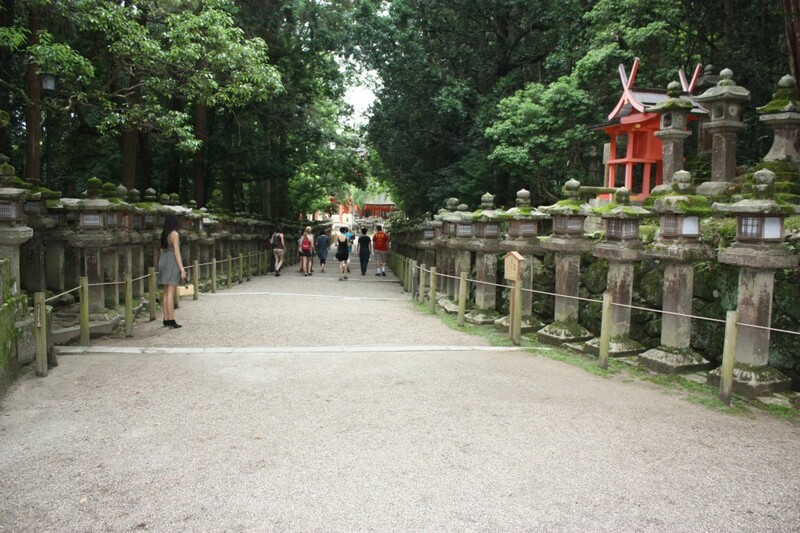 We battled the increasing humidity as Masako explained the shrine’s history and showed us the hundreds of stone lanterns scattered across the grounds. Although none of the lanterns were lit while we were there, a visitor to the shrine during one of the major annual festivals held at the site might be lucky enough to see at least a few candles burning within them. On the way back from Kasuga we feasted at an all-you-can-eat buffet, and then, full of too much food and drowsy from foreboding weather, went to bed early at our new home, the Kyoto Vista hotel.